This magical wonderland of lights and colour will be sure to create the ultimate Christmas spirit! 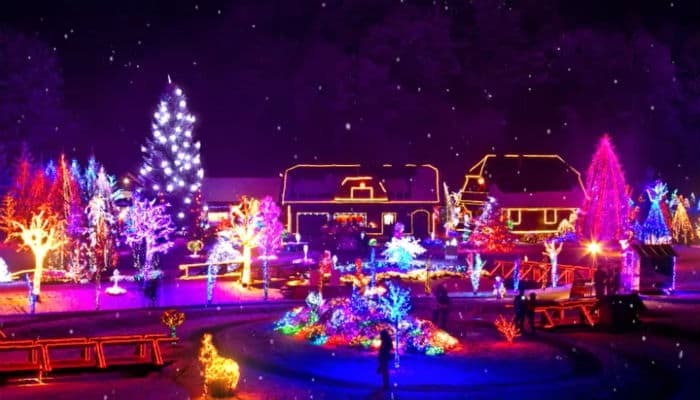 This village certainly knows how to celebrate the festive season with a Wow! Each house looks like they are desperately trying to compete with the dazzle and sparkle, telling everybody that Chistmas holiday season truly has arrived. As we all know there is always a village or house we become to love at Christmas time as every year they never fail to disappoint, with their endless array of lights and decorations outside their home. You could imagine driving through this village and seeing children point and gasp in wonder at the sight. Your imagination also runs wild at the amount of lights and decorations that encompass the inside of their homes too! The lights are also spectacular in the trees next to their homes. The trees lights sparkle off the page as the card plays and this adds a lovely added character to the card. At Ecard Shack, we always find our customers love the Christmas lights on these holiday ecards for business, especially the animation that sparkles and shines. We always try to create a magical quality to our cards and this design never disappoints. Please visit our website today and see our fantastic selection of high quality Christmas ecards for business.